The process of opening a coffee shop can be a stressful and confusing experience for first-time business owners and those without prior knowledge of the coffee industry. 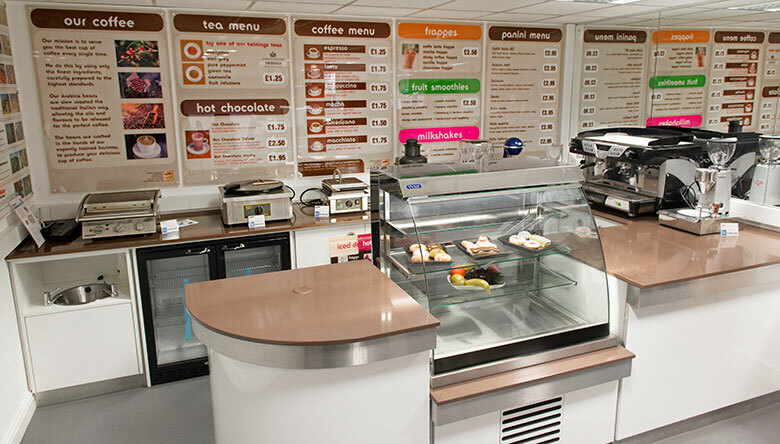 If you are considering or thinking or opening a coffee shop or cafe, then we can help you create your dream by providing custom-built servery counters, display units, coffee machines, catering equipment, fresh coffee beans and ingredients all within one custom package that meets your requirements. Utilising your very own designs (please note: we do not provide a design service), we can build custom units to suit your serving style and shop layout with a tailored package that will take the stress out of sourcing the essential coffee shop equipment you need. Our packages can include everything you could possibly need; from the bare essentials - like an espresso machine and display cabinet - through to optional appliances such as commercial microwaves, ice machines and much more. With over fifteen years in the coffee industry, we truly are the experts when it comes to beans, machines and everything in between. Send us your drawings or designs of the counter layout along with a list of equipment you need for your menu to COOK IT, PREPARE IT, DISPLAY IT, SERVE IT, STORE IT and we can prepare a quote for you. If you have a plan in place and want to get your own coffee shop up and running then call 01977 687 580 today. If you would like to see an example of what is achievable with our bespoke system, we have a fully working installation of what is possible with our service on site inside our headquarters near Leeds. Featuring a fully bespoke counter area, chilled display cabinet, Victoria Arduino espresso machine a number of other essential appliances, it features everything that a typical package comprises of - all of which can be tailored to your own designs. Additionally, we also have a dedicated barista training facility complete with a large range of coffee machines and a specialist catering showroom which holds a wide range of products, most of which can be previewed and tested. If you have never used a coffee machine before, then getting to grips with making 'proper' coffee might be a daunting prospect but not only do we offer free full barista training with every machine purchase, we also have a comprehensive online repository of all the Barista tips and tricks you could ever need. Not only are we coffee industry professionals and trained baristas ourselves, we are your potential customers! It's because of this, that we do our utmost to keep up-to-date with all the changes, trends and industry news so that we can offer the best training and advice possible. So you've decided that you want to start a coffee shop, or you've set the wheels in motion for opening a coffee shop, what key advice do you need to know? We deal with thousands of coffee shops up and down the country every single year, so we like to think we have a good grasp of what it takes to be a success within the coffee industry. If you're serious about starting a coffee shop and serving steaming hot drinks in a multitude of ways and willing to learn the methods, then you've come to the right place. Why do you want to start a coffee shop? You really need to think about this hard. Ask yourself why you want to own or open a coffee shop and what you hope to achieve by doing so. Do you simply like making coffee? Or are you seriously passionate about all things Arabica and Robusta? The level of work required needs to be considered. Do you understand the level of work and hours required to make your business a success? Can you deal with both customers and staff, all whilst managing everyday issues? It may be worthwhile considering working within a coffee shop environment for a short period or length of time to see exactly how a coffee shop operates. You now need a business plan. But why? Unless you are funding the process of starting a coffee shop yourself, it's likely you'll need the help of a lender such as a bank or building society. As a result of this, your business plan will provide the main basis for any lending negotiations you'll have to undertake with a third party. The business plan is one of the key ways of securing investment from any money lender, this shows you have a grasp of what is expected within your chosen business area. Picking a machine that suits your budget, style and needs is always going to be a difficult task, whilst we can't choose the exact machine for you, we can help point you in the right direction. Not every coffee shop needs a machine that is capable of making hundreds of coffees per day, and that's where our expertise comes in, we understand how each coffee machine fits into each scenario. Mobile coffee operations, despite the core product, will differ significantly from bricks and mortar coffee shops - mainly due to the limited access to water and power. So compromises and changes will have to be made. If design is key component in how you foresee your coffee shop, then we have a range of high-end, designer coffee machines that can provide the framework for true artisan coffee creation. We even have a handy coffee machine picker if you want to get started before you even give us a call, it might not give you a make or manufacturer, but it will give you an indication of just what type of machine you'll likely be looking at. How much does it cost to make a cup of coffee? Do you know how many cups of coffee you can make from the average 1kg bag of roasted coffee beans? From the average high street shop you'll pay around £2.50 for a standard cup. With our most popular signature blend - Super Crema - works out at around 8p for a standard espresso and on average you can make around 135 to 140 cups per 1kg bag. This equates to roughly £326.70 potential profit per bag! This will vary depending on what coffee blend you use and even the amount of milk used in each drink. For a good guide of the costs of making coffee, we have created a Coffee Calculator to give you an indication of the potential Gross profit margins capable with speciality coffee. Are you properly trained in how to use a coffee machine? Being able to use your expensive equipment will prove key to how well your coffee shop is able to operate. Whilst many suppliers offer basic training, not all will offer fully fledged Barista training with the sale of a machine. With every single coffee machine that we sell, we offer the opportunity for FREE Barista training, so that you feel at home using your brand new machine. Creating the layout and design of your coffee shop is an important step in the planning process. Where will your counters and coffee machines go? Where will customers queue? How much space will people need to sit and drink/eat in your shop? We don't provide a design service, however once you've planned out your layout and design, we can turn your plans into reality, utilising a range of custom built counters and display units, as well as any other equipment you may need. Call us today on 01977 687 580 to get advice and information on how to get your new coffee shop up and running.